Donbas militants waged 57 shelling attacks on Ukrainian military and residential areas. Over the past day, Ukrainian servicemen and front-line settlements withstood 57 instances of shelling in the area of the anti-terrorist operation in Donbas. On five occasions, Russia-backed terrorists hit the residential areas on the frontline. The ATO press center said in a Facebook release on 13 June that one Ukrainian soldier was killed and five were wounded in action over the past 24 hours. In the coastal sector, militants fired 152-mm artillery opposite the settlements of Hrafske and Olhinka. At around 22:00, they shelled Maryinka from opened fire IFV weapons and grenade launchers. As a result of the shelling, a fire broke out in a house at Zhovtneva St., fortunately, no casualties among civilians have been reported. In the same sector, the enemy repeatedly fired mortars and small arms at the positions of the ATO forces near Pavlopil, Maryinka and Chermalyk. In the area of Shyrokyne, Vodyane, Talakivka, Hnutove and Berezove. It was relatively calm in the Donetsk sector, although the militants intensified the shelling with the onset of twilight, mostly in the southern suburb of Avdiyivka and Kamyanka. Here, the enemy fired 120- and 82-mm mortars, tanks, anti-aircraft guns and infantry weapons. The terrorist made a few shots from 125-mm tank guns at the residential quarters of Avdiyivka. Fortunately, there were no casualties. The residential quarters of Zaitsevo were shelled from heavy machine guns. 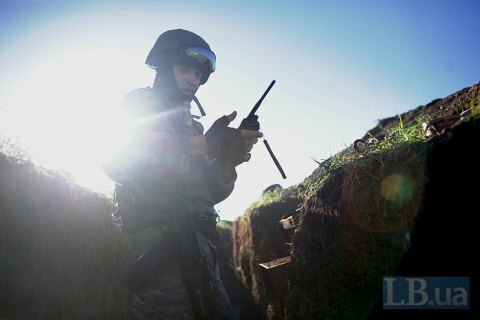 In the Luhansk sector, the terrorists waged 18 shelling attacks from 120-mm mortars at the positions of the ATO forces in the areas of Troyitske and Kryakivka. Near Novotoshkovske, Katerynivka, Tryokhizbenka, Solote and Novooleksandrivka the enemy fired 82-mm mortars. Novooleksandrivka was twice shelled from anti-tank missile systems, while in the area of Krymske, Ukrainian came under the fire of enemy IFV weapons. The fortifications of Ukrainian military in the vicinity of the settlements Zhovte, Lobachovo, Novotoshkivske, Stanytsya Luhanska and Malynove were under the fire of grenade launchers and small arms. Previously, the US Embassy called on militants to cease attacks on civilian infrastructure in Donbas.